A complete denture is a full in-mouth appliance that replaces your natural teeth in the event they have been lost or damaged. A denture will support your cheeks and lips, restoring function and form to your smile. At Family Dental Care Center, dentures remain one of our major focuses. Serving Drexel Hill, Lansdowne, Aldan, PA, and all the surrounding communities, it’s our mission to provide high-quality dentures at affordable prices. In some cases, for patients who meet certain criteria, we can even provide dentures on the same day of their appointment. We also offer partial dentures for those people who do not require a full set. Removable partial dentures consist of replacement teeth attached to gum-colored bases. A partial denture will be designed for you and attached using a metal framework and clasps that connect the partial to your teeth. Contact us to schedule an appointment, so we can determine if partial dentures are the solution for you. Often, the process of getting custom, beautiful dentures begins with the extraction of all existing teeth. 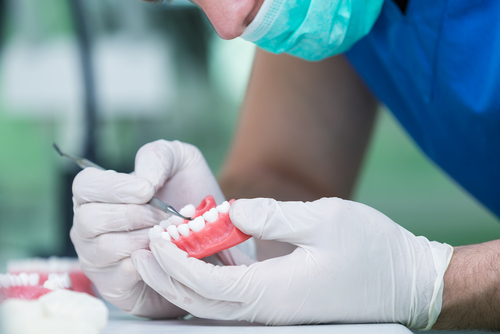 Next, the denture creation process begins – your dentist will create a denture set made specifically for your mouth, replacing all of your natural teeth. Conventional dentures are fitted after a full-mouth extraction (all teeth are removed) once your gums have fully healed. In many cases, immediate dentures are created and fitted immediately after the extractions. This will allow the gums to properly heal under the denture. If your situation calls for more support, your dentures can be anchored to implants to ensure they fit as securely as possible. Dentures main purpose is to replace missing teeth. The resulting health and appearance benefits can be profound for our patients, helping them lead happy, confident lives. When a patient is finally able to eat comfortably or speak clearly again, we know we’ve done our part to improve someone’s life. A major reason to utilize dentures is the prevention of eventual imbalances in your facial structure from missing teeth. Missing teeth cause the muscles in your face to sag, making you appear older. Dentures will effectively support your natural facial structure in the event you have lost teeth. While it’s truly meant to help you feel more comfortable eating and speaking, it also helps to make your appearance younger by retaining the muscle tone in your jaw, neck, and face. With traditional denture services, patients are asked to wait for the gums to completely heal after their extraction procedures before having their dentures placed. This requires the patient to go weeks, or even months, without teeth, which never sounds appealing to the person undergoing the procedure. It’s because of this that the team of dental professionals at Family Dental Care strive to perform denture services differently. Our process asks for patients to arrive early on the morning of your appointment in order to make impressions for your final denture. This will allow us to perform all necessary extractions during the day so that you receive your dentures by the time our office closes. With this method, you could be flashing a whole new set of pearly whites thanks to our state-of-the-art 3D X-ray technology. This initial set of teeth, although temporary, locks into place, meaning you can immediately start eating the harder foods you were most likely deprived of prior to the procedure. Within six months, you will receive the final denture, which locks firmly into the same mechanism that held your temporary ones. These dentures are the last and final step in the process. Meant to last for years and years to come, your permanent dentures restore your smile and allow you to eat and speak normally. With the added confidence of a beautiful smile, we expect a higher quality of life for our patients after our procedure is complete. We offer denture implants for any complete or partial denture fittings in addition to 24-hour dentist access when you call our clinic. Serving Drexel Hill, Lansdowne, Aldan, PA, and all the surrounding areas, Family Dental Care Center makes affordable denture services more convenient and accessible than ever. A beautiful, functional new smile is only a phone call or visit away. Call us at 484-791-2138 to schedule an appointment.